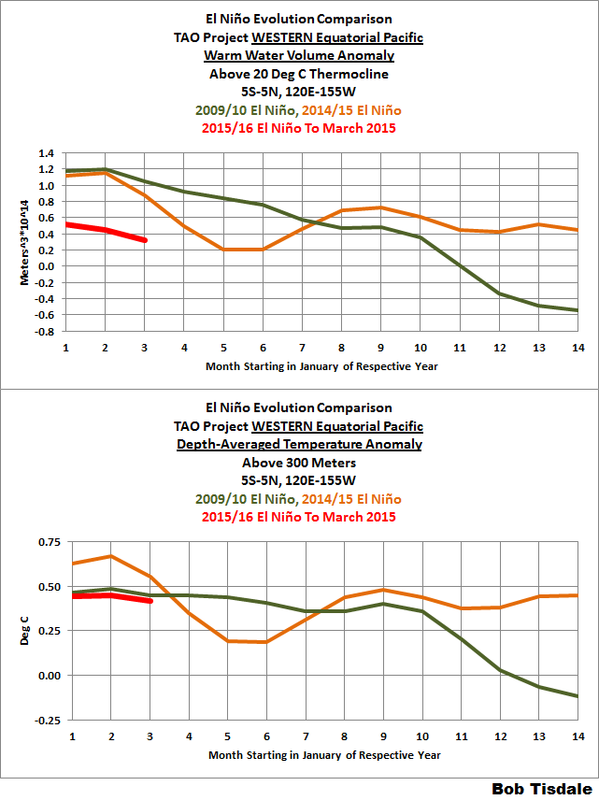 March 2015 ENSO Update – Will the 2014/15 El Niño Become the 2014/15/16 El Niño? 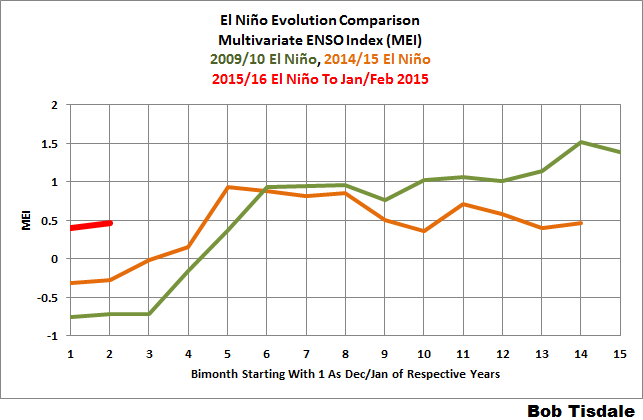 This post provides an update of many of the ENSO-related variables we presented as part of the 2014-15 El Niño Series. The reference years for comparison graphs in this post are 2009 and 2014, which are the development years of the last two El Niños. I have not included animations in this post. In their place, I’ve compared present-day maps from the NOAA GODAS website to the same time in 2014. Because there’s talk of this El Niño becoming a multiyear event, in an upcoming post, we’ll compare the current event to the 1986/87/88 El Niño, which was the only multiyear El Niño during the satellite and TAO project eras. Early last month, NOAA announced El Niño conditions in the tropical Pacific. Of course, that announcement was, in part, necessary because the 2014/15 event will appear as a very weak El Niño on NOAA’s Oceanic NINO Index (ONI) this month, having begun in the Sep-Oct-Nov “season”. See Part 23 of the 2014/15 El Niño Series. A second opinion: the ENSO Tracker dated March 31, 2015, from Australia’s Bureau of Meteorology (BOM) shows the tropical Pacific is currently in El Niño Watch conditions, which means we presently are not experiencing El Niño conditions. The March 10, 2015 update from the Japanese Meteorological Agency (JMA), which uses NINO3 region sea surface temperatures for their definition of El Niño conditions, was noting that the El Niño conditions (that began in boreal summer 2014) had ended. Then there’s NOAA’s Multivariate ENSO Index (MEI). Their March 3rd update noted we’re presently in weak El Nino conditions. Like much of last year, we’re getting mixed signals from the BOM, JMA and NOAA because of the different definitions of El Niño conditions and because of the weak El Niño conditions. Because the sea surface temperature anomalies of the equatorial Pacific are at or above the threshold of an El Niño at the beginning of 2015, because a downwelling (warm) Kelvin wave is presently making its way eastward along the equatorial Pacific, and because of a recent westerly wind burst (which help to push warm water from west to east along equatorial Pacific), there is talk of the El Niño conditions (NOAA’s definition) continuing through the 2015/16 ENSO season. But, not so fast: see the post Déjà Vu: El Niño Take Two at the NOAA ENSO blog. Then again, according to the BOM’s definition, there is a 50% chance that El Niño conditions might develop in 2015. See the BOM ENSO Wrap-Up. The Japanese Meteorological Agency (JMA) is also noting that El Niño conditions are more likely than ENSO-neutral conditions by boreal summer. Again refer to the JMA’s March update. This post provides an update on the progress of the evolution of the 2015/16 El Niño (assuming one continues using the NOAA definition) with data through the end of March 2015. The post is similar in layout to the updates that were part of the 2014/15 El Niño series of posts here. The post includes 17 illustrations so it might take a few moments to load on your browser. Please click on the illustrations to enlarge them. Included are updates of the weekly sea surface temperature anomalies for the four most-often-used NINO regions. Also included are a couple of graphs of the BOM Southern-Oscillation Index (SOI) and the NOAA Multivariate ENSO Index (MEI). For the comparison graphs we’re using the El Niño evolution years of 2009 and 2014 (the last two El Niños) as references for 2015. The 2009/10 El Niño was moderately strong, while the 2014/15 event was extremely weak and intermittent. And since there is another downwelling (warm) Kelvin wave making its way east along the equator in the Pacific, also included in this post are evolution comparisons using warm water volume anomalies and depth-averaged temperature anomalies from the NOAA TOA project website. Then, we’ll take a look at a number of Hovmoller diagrams comparing the progress so far this year to what happened in both 2009 and 2014. Last, we’ll compare maps and cross sections (2014 and 2015) from the GODAS website of a number of ENSO-related metrics. Note: The NOAA NOMADS website is still off-line (very loud growling noise heard from me), so I used the weekly NINO region sea surface temperature anomaly data for Figures 1 and 2 from the NOAA/CPC Monthly Atmospheric & SST Indices webpage, specifically the data here. The data from NOAA NOMADS was provided with oodles of significant figures, while the NOAA/CPC data are provided in tenths of a degree C. The base years for anomalies for the NOAA/CPC data are referenced to 1981-2010. As of the week centered on March 25, 2015, the sea surface temperature anomalies for all NINO regions were above the 0.5 deg C threshold of El Niño conditions. Will they remain there, strengthen or weaken as we continue through the rest of the year? Note that the horizontal red lines in the graphs are the present readings, not the trends. Using weekly sea surface temperature anomalies for the four NINO regions, Figure 2 compares the goings on this year with the 2009/10 and 2014/15 events. All of the NINO regions this year are warmer than during the same times of the reference El Niños. And that makes sense because we’re starting this year in weak El Niño conditions, where we weren’t during the two reference years. The updated (January-February) MEI has risen by 0.06 standard deviations to +0.47, for a slightly increased ranking, thus getting back above the weak El Niño threshold (upper 30%ile). Similar oscillations across this threshold were observed during the 2004-05 El Niño. Looking at the nearest 12 rankings (+/-6) in this season, four cases either maintained or even enter El Niño status for at least another 2 months during boreal spring, while four other cases dropped back to La Niña (4) by May-June, illustrating the so-called ‘spring-predictability barrier’ quite nicely. 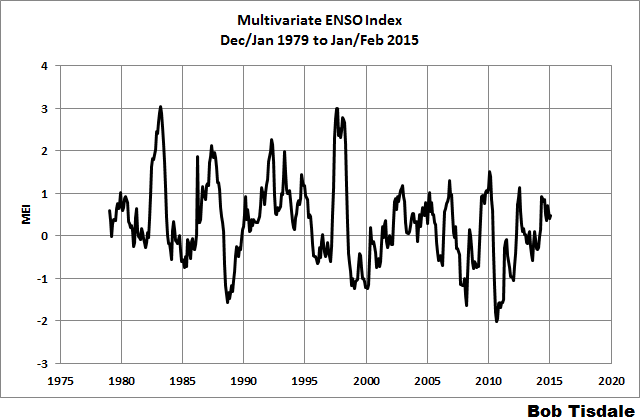 Update: The Multivariate ENSO Index update discussion and data for January/February were posted back on March 3rd. Figure 3 presents a graph of the MEI time series starting in Dec/Jan 1979. And Figure 4 compares the evolution this year to the reference El Niño-formation years of 2009 and 2014. In the following three illustrations, we’re comparing data for the evolution of the 2015/16 “season” so far (through March 2015) with the data for the evolutions of the 2009/10 and 2014/15 El Niños. The Warm Water Volume data are the top graphs and the depth-averaged temperature data are the bottom graphs. As you’ll see, the curves of two datasets are similar, but not necessarily the same. Let’s start with the Western Equatorial Pacific (5S-5N, 120E-155W), Figure 5. The warm water volume data show the Western Equatorial Pacific began 2015 with noticeably less warm water than during the opening months of 2009 and 2014. Depth-averaged temperature anomalies, though, are comparable to 2009 but noticeably less than last year. Because we’re starting 2015 in El Niño conditions (or near to them), both warm water volume and depth-averaged temperature anomalies in the Eastern equatorial Pacific (5S-5N, 155W-80W) are noticeably higher at the beginning of this year than in 2009 and 2014. See Figure 6. Across the entire equatorial Pacific, Figure 7, in 2015, warm water volume is slightly lower than in 2014 but noticeably higher than in 2009. Depth-averaged temperature anomalies in 2015 are slightly higher than in 2014 and, again, noticeably higher than in 2009. It will be interesting to compare these metrics in 2014 and 2015 to the evolution of the multiyear El Niño of 1986/87/88. The Southern Oscillation Index (SOI) from Australia’s Bureau of Meteorology is another widely used reference for the strength, frequency and duration of El Niño and La Niña events. 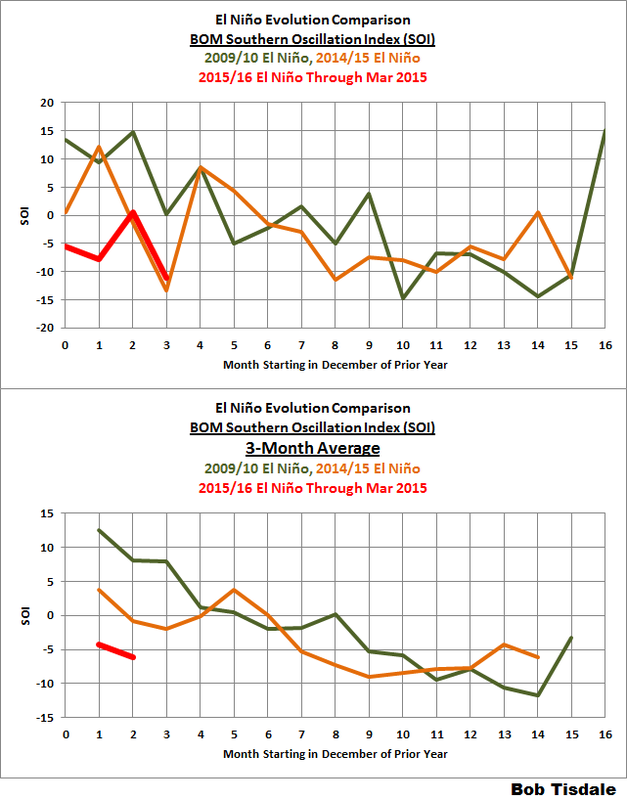 We discussed the Southern Oscillation Index in Part 8 of the 2014/15 El Niño series. It is derived from the sea level pressures of Tahiti and Darwin, Australia, and as such it reflects the wind patterns off the equator in the southern tropical Pacific. With the Southern Oscillation Index, El Niño events are strong negative values and La Niñas are strong positive values, which is the reverse of what we see with sea surface temperatures. The March 2015 Southern Oscillation Index value is -11.2, which is a greater negative value than the threshold of El Niño conditions. (The BOM threshold for El Niño conditions is an SOI value of -8.0.) Figure 8 presents a time-series graph of the SOI data. Note that the horizontal red line is the present monthly value, not a trend line. 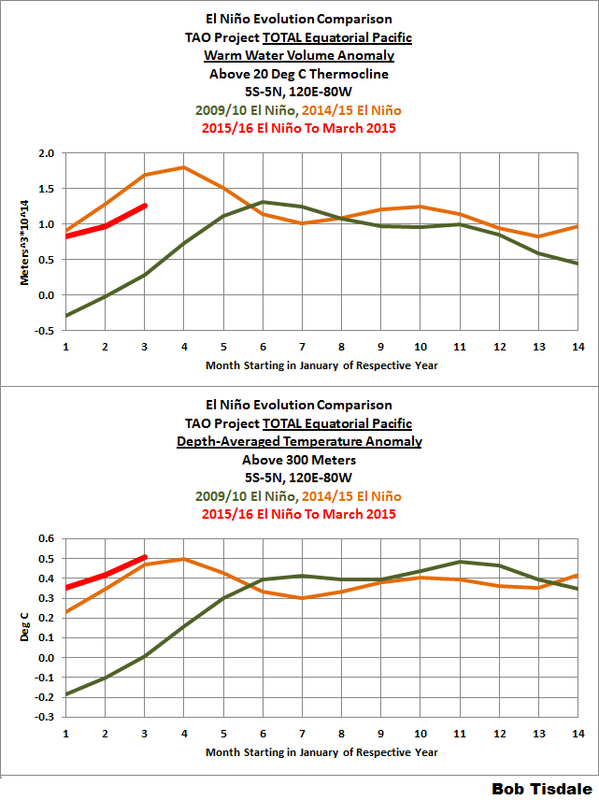 The graphs in Figure 9 compare the evolution of the SOI values this year to those in 2009 and 2014…the development years of the 2009/10 and 2014/15 El Niños. The top graph shows the raw data. Because the SOI data are so volatile, I’ve smoothed them with 3-month filters in the bottom graph. 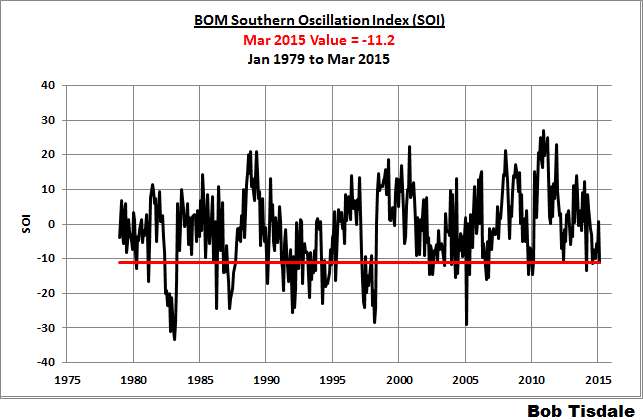 Referring to the smoothed data, the Southern Oscillation Index this year is ahead of the values in 2009 and 2014. For those of you interested in keeping a closer eye on the BOM Southern Oscillation Index, see the BOM Recent (preliminary) Southern Oscillation Index (SOI) values webpage. For more than 2 weeks, the 30-day running-average of the SOI has been in El Niño conditions, while the 90-day running-average remains ENSO neutral. NOTE: The NOAA GODAS website has not yet added 2015 to their drop-down menu for Hovmoller diagrams. For the following illustrations, I’ve used the Hovmolller diagrams available for the past 12 months, deleted the 2014 date and aligned the 2015 data with the other 2 years. Hovmoller diagrams are a great way to display data. If they’re new to you, there’s no reason to be intimidated by them. Let’s take a look at Figure 10. It presents the Hovmoller diagrams of thermocline depth anomalies (the depth of the isotherm at 20 deg C. Water warmer than 20 deg C is above the 20 deg C isotherm and below it the water is cooler). 2015 is in the center, 2009 on the left and 2014 to the right. Figure 10 is presenting the depth of the 20 deg C isotherm along a band from 2S to 2N. The positive anomalies, working their way eastward early in 2014 and 2015, were caused by downwelling Kelvin waves, which push down on the thermocline (the 20 deg C isotherm). You’ll note how, early in 2014, the anomalies grew in strength as the Kelvin wave migrated east. (We should expect the same to happen this year.) That does not mean the Kelvin wave is getting stronger as it traveled east; that simply indicates that the thermocline is normally closer to the surface in the eastern equatorial Pacific than it is in the western portion. Note how there were also three downwelling Kevin waves each in 2009 and 2014. The first in 2009 was much later in the year than in 2014. And the last downwelling Kelvin wave in 2009 was much stronger than the first two, helping to reinforce the evolution of the 2009/10 El Niño so that it peaked at its “normal” season. On the other hand, the strongest downwelling Kelvin wave in 2014 happened early in the year, very early in the “normal” ENSO season. Will an upwelling (cool) Kelvin wave, which normally follows a downwelling (warm) Kelvin wave, suppress the development of the El Niño this year, as it had last year? Or will an upwelling (cool) Kelvin wave be strong enough to flip the tropical Pacific into La Niña conditions? The two westerly wind bursts shown in red in the western equatorial Pacific in 2014 are associated with the strong downwelling Kelvin wave that formed at the time. (See the post ENSO Basics: Westerly Wind Bursts Initiate an El Niño.) Throughout 2009, there was a series of small westerly wind bursts in the western equatorial Pacific, with stronger ones later in the year. We didn’t see the continued westerly wind bursts in 2014, which suppressed the evolution of the 2014/15 El Niño. And Figure 13 presents the Hovmollers of sea surface temperature anomalies. Unfortunately, the Hovmoller of sea surface temperature anomalies is delayed a few weeks at the GODAS website. But as we’ve seen in the comparison graphs in Figure 2, the sea surface temperature anomalies of the NINO regions in 2015 are well ahead of those in 2009 and 2014. As opposed to presenting animations from NOAA’s GODAS website of maps and cross sections of a number of metrics, I thought it would be better (more informative) to compare the most recent maps and cross sections from this year to those from the same time last year. So let’s start with the cross sections of temperature anomalies along the equator. Figure 14 compares the subsurface temperature anomalies along the equator (2S-2N) for the pentads (5-day averages) centered on March 29, 2015 (left) and March 29, 2014 (right). The equatorial Indian Ocean is to the left in both Illustrations and the equatorial Atlantic is to the right. We’re interested in the equatorial Pacific in the center. The illustrations confirm what was shown in the depth-averaged temperature anomaly graphs in Figures 5 and 6. The subsurface temperature anomalies in the western equatorial Pacific are cooler this year than last, but in the eastern equatorial Pacific, they’re warmer this year. Figure 15 presents global maps of the depth-averaged temperature anomalies to depths of 300 meters (a.k.a. T300 anomalies). Looking at the tropical Pacific as a whole, not just the equator, the downwelling Kelvin wave this year is traveling eastward into a warmer eastern tropical Pacific than last year. That makes sense because El Niño conditions already exist this year according to NOAA. Also note that the western tropical Pacific is much cooler this year than last. Does this mean that the upwelling (cool) Kelvin wave that follows will be much stronger than the one last year? We’ll have to wait and watch. Also note the T300 anomalies in the Northeast Pacific. The “blob” still exists. Sea surface height anomalies, Figure 16, are often used as a proxy for temperature anomalies from the surface to the ocean floor. They are showing lower sea levels in the western tropical Pacific this year than last and showing that the downwelling Kelvin wave is moving into a warmer eastern tropical Pacific. I fear it will take a very strong La Niña to overcome the effects of the “blob” on the North Pacific. Even then, there may have been an upward shift in sea surface temperatures there, which would impact the entire east Pacific. We’ll have to keep an eye on it over the next few years. Last year, I lowered the price of Who Turned on the Heat? from U.S.$8.00 to U.S.$5.00. A free preview in pdf format is here. The preview includes the Table of Contents, the Introduction, the first half of section 1 (which was provided complete in the post here), a discussion of the cover, and the Closing. Take a run through the Table of Contents. It is a very-detailed and well-illustrated book—using data from the real world, not models of a virtual world. Who Turned on the Heat? is only available in pdf format…and will only be available in that format. Click here to purchase a copy. My sincerest thanks to everyone who has purchased a copy of Who Turned on the Heat? as a result of the 2014-15 El Nino series. I learned a lot preparing the book. I hope you’ve learned a lot, too, studying it. 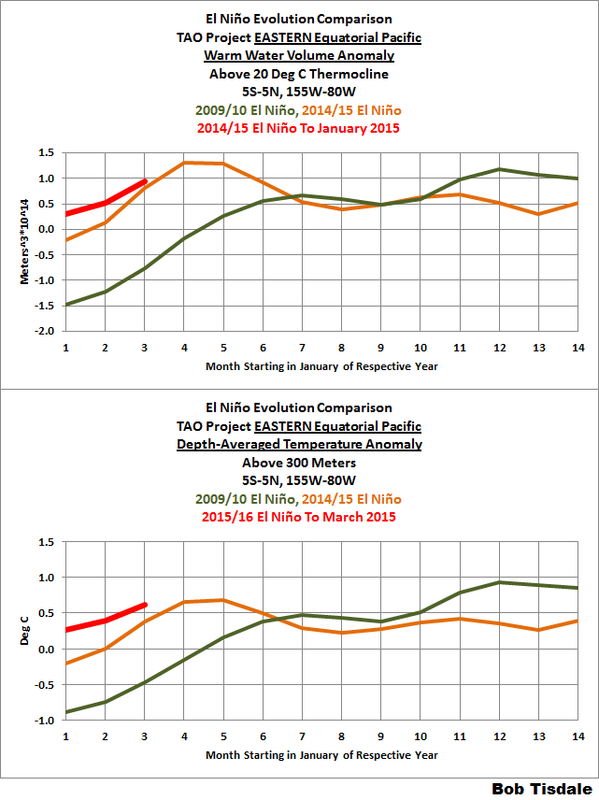 6 Responses to March 2015 ENSO Update – Will the 2014/15 El Niño Become the 2014/15/16 El Niño? As always your March 2015 ENSO Update is the widest, deepest probe into the conditions of the oceans. Next week we’ll probably get the NOAA take on the MEI and their ENSO forecast. Alec, aka Daffy duck, and if it doesn’t hold up, they can always point to the spring prediction barrier. Alec, aka Daffy duck, should that be a super-Cali-drought-buster El Nino? Pingback: NOAA ENSO Model Now Forecasting a Supercalifragilistic El Niño for 2015/16 Season | Watts Up With That?